Babies love black and white. 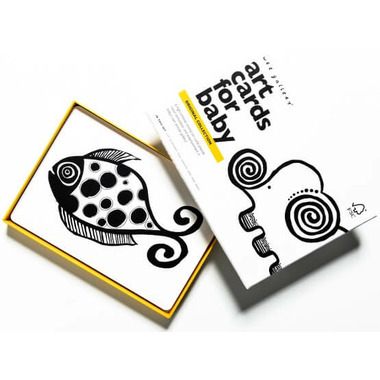 A boxed set of high-contrast cards will engage and entertain baby right from day one. This set includes an Elephant, Fish, Giraffe, Snail, Owl and Cat. 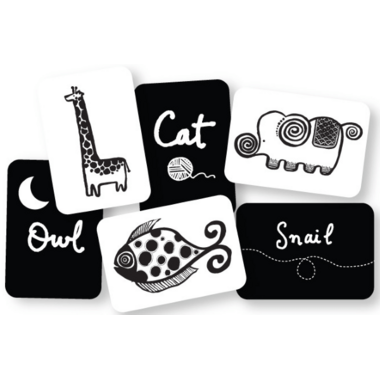 Printed on sturdy board, these cards will stand up to baby's explorations. Each 5 x 7″ card is beautifully finished with matte lamination and child-friendly rounded corners. Also makes for beautiful art work in the nursery. Well made large cards, very effective in my clinic to entertain young babies while being treated...they love them!